We’d love your help. Let us know what’s wrong with this preview of Clover by CLAMP. To ask other readers questions about Clover, please sign up. Clover is a beautiful novel art-wise, but its disjointed plot and odd formatting made it a very confusing read. I liked the manga right-to-left reading style but the strangely sized panels and odd text pop-ups didn't make a lot of sense to me. Someone sent it to me as a gift but I think this book is better read in print than online. Recommended to Nyssa by: Saw it at the Bookstore..it looked interesting. What the hell did I just read!?! I honestly thought, after seeing in the synopsis that this was originally intended to be a six book arc, that the powers that be reworked the story since the whole thing ended after four books. After a very confusing beginning in Clover One, there followed two more comprehensible, and interesting volumes. Clover 4, the final book, however, launches into another possibly interesting story line but then spirals into nothingness! The book, the omnib What the hell did I just read!?! After a very confusing beginning in Clover One, there followed two more comprehensible, and interesting volumes. Clover 4, the final book, however, launches into another possibly interesting story line but then spirals into nothingness! The book, the omnibus, and the series just ends! I want my 4 days back. This literally went absolutely nowhere! On an up note, the artwork included at the end of the omnibus was stunningly beautiful! I remember flipping through the first volume of this, years ago. I was intriugued by the art but even before it was taken out of print it was a bit hard to find. Imagine my surprise when I saw that it had been reprinted as an omnibus version including all 4 of the original books (as well as a bunch of nice colour art)! It's hard to rate this as a book, because the story is not only incomplete (the magazine it was serialized in went out of publication) but a bit lacking at times (and I will admit, I remember flipping through the first volume of this, years ago. I was intriugued by the art but even before it was taken out of print it was a bit hard to find. Imagine my surprise when I saw that it had been reprinted as an omnibus version including all 4 of the original books (as well as a bunch of nice colour art)! I wish for happiness; I seek happiness; to find happiness with you. Clover is a work by CLAMP that has long been out of print in English due to Tokypop's rather ridiculous, in my opinion, decision to stop printing it. I've been searching high and low for this manga for years, and it's taken at least six before I've finally been able to get my hands on it in the omnibus edition in the original format of right-to-left. I was a fan of Card Captor Sakura back when I was twelve and CLAMP was, of cours I wish for happiness; I seek happiness; to find happiness with you. Clover is a work by CLAMP that has long been out of print in English due to Tokypop's rather ridiculous, in my opinion, decision to stop printing it. I've been searching high and low for this manga for years, and it's taken at least six before I've finally been able to get my hands on it in the omnibus edition in the original format of right-to-left. I was a fan of Card Captor Sakura back when I was twelve and CLAMP was, of course, one of the first manga-ka I looked into, and this is one of the series that has always had an elusive, mysterious aura around it and seems to have been largely forgotten. I've wanted it for a long time, and I can tell you, there's no words to describe how happy I was to actually have it in my hands and to be able to read it for myself. My first reaction was to smile - my second was to drop it, since this book should be labelled as being ridiculously heavy, even though I really should have expected that. That aside, I'd been promised great things about Clover from many different people; and I wasn't disappointed. The one word to sum up Clover, is that it's different. The panels are different - it is more likely for the page to be empty with one block background colour over a screentone to reflect a character's mental state - a lot of the text is made up of the lyrics of the songs. This may immediately make you recoil, but only for the reason of Clover being the mystery of the unknown. I've read countless manga by various artists over the years, including others by CLAMP, which leads me to instantly think it's wrong - but it's not. If you persevere past those initial thoughts, you can easily see how wonderful it really, truly, is. The fact the art style and story telling is still unique after ten years from it's original publishing date is also a feat. CLAMP truly did make a masterpiece with this one. Even if the pages may appear to be empty, the drawings that are there are smooth and intricately detailed when needed. Each character leaps out at you even with the most limited words. I, for one, truly felt for the story of each and every character, and even though at first some of it took a while to sink in, I felt each emotion that was meant to be conveyed through each sequence. Even by the littlest things like a black solid colour over a white one. A small box on a page. Ran staring out a window. Suu looking up at nothing in particular. Anything. I got the message. A lot of the dialogue is also limited - but a great story doesn't have to be told through lots of words. Simple, selective words get the point across and perhaps have more meaning than pages of solid text. And the use of the lyrics repeatedly was an off-putter at first, but really, it adds to the story and its sense of knowing that it's different. It really did provide it with individuality. The story is fairly simple - a country set in a futurstic world, run by a group of people known as the Wizards. Children with powers have previously been taken and marked as Clover's - one to four leaf. Suu is the only four leaf. As time goes on, the other Clover's are revealed as well as their respective abilities. Clover goes through multiple twists that you may or may not guess that trip you at every turn. As for the plot.. if you want one word to sum up the entire set of each Clover's story, it would be happiness, or love. Each one just wants to be happy, which isn't that big of an ask. For CLAMP, this is usually shown by being loved, or being able to love. And this is shown here, too. And it's heartwrenching to see the happiness each long for either being taken away or limited or only having a set time limit. Truly, I wish CLAMP would continue this and produced volume 5 or 6. It's typical for me to fall for the work they haven't finished; another of my favourites is also in a state of forseeably permenant hiatus. But I'll make do with what I have. For it's a story that holds a lot of meaning, and makes you appreciate those around you and what you do have whilst you have it. It's a beautiful story, and I would be giving it more stars if I could. Endless amounts. If the story itself isn't a draw, or you already have the flipped Engish version, the ombinus is completely worth it for the coloured pages that have been included. Each respective book start has several coloured pages for the splash as well as a full page of lyrics, all in colour. At the back of the book, each coloured drawing of Clover ever produced by CLAMP is included. It's like a mini-art book in a way; but it's all absolutely gorgeous, so I have no complaints. Incredibly beautiful manga. Curious story about love with a heap of sci-fi thrown in. The story was told a bit strangely and may not fit everyone's tastes, but good lord is the art glorious. Worth reading just to look at the artwork even if the story is not your cup of sakè. for starters, this book is huge. but you soon discover the reason for its size; it contains 4 volumes. totally made the 20 bucks i spent on it, worth it. but regardless of its size, it only took a couple of hours to read, and was finished in one siting (not something i'm normally able to do with manga of this size). i wish i would have started with clover as my first clamp read, it would have totally changed my perspective on their writing style. i had orginally picked this up a couple of weeks for starters, this book is huge. but you soon discover the reason for its size; it contains 4 volumes. totally made the 20 bucks i spent on it, worth it. but regardless of its size, it only took a couple of hours to read, and was finished in one siting (not something i'm normally able to do with manga of this size). i wish i would have started with clover as my first clamp read, it would have totally changed my perspective on their writing style. i had orginally picked this up a couple of weeks ago because i have a rabbit named clover and thought that it was neat to see a book with her name. i flipped through a few pages, breifly glanced at the artwork inside and the back, then put it back down thinking that surely it could not have a fully developed story with so few pictures and words. boy was i mistaken! it is perfect in the form that it is in. it almost has a "metropolis" (the movie) feel to it. but i actually liked this, and didn't like the movie. i was choked up the entire time i was reading this series, er book. the story is presented out of order, (the ending comes in book 2) but is done in way way where you are left wondering if that was really the end. as you continue to read you realize that you really did loop back in time to meet all four levels of clovers. i was left wondering if there was really only one four-leaf out there, or was she the only one found. you see people struggle to hold onto the power that they have fought to obtain and their tactics to use whatever means necessary to maintaining that power. i saw them ruling in fear instead of the other way around, which would have honestly been true to form of the machiavellian nature presented here. you see consequence of actions taken and how they affect others, even if you live all alone. it was a masterpiece through and through, and i'm glad they gave credit to the artists in the clamp group that created it: mokona and ohkawa (which is a first for me, i normally don't see credit given to any individuals inside of clamp). if clamp ever decides to add to it, i'll most certainly be one of the first in line to purchase, but it's also fine if it's never picked up again. the ending already there along with everything else, it's fine. "I love you, Sue. I wish we could have met. I would have held you in my arms." Each CLAMP story inevitably has a scene that reduces me to tears. This was the one. 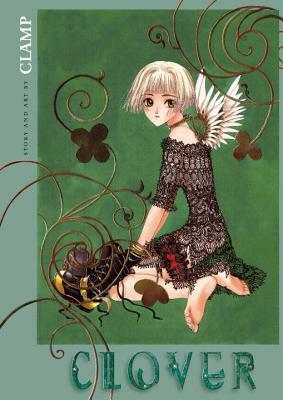 I read Clover for the first time in what must have been middle school, when the separate novels were published in an especially artistic style, intricate covers with green translucent parts and color splash pages included. I'm afraid that at the time, I did not appreciate the manga at all. I read it once and then never picked up again u "I love you, Sue. I wish we could have met. I would have held you in my arms." Each CLAMP story inevitably has a scene that reduces me to tears. This was the one. I read Clover for the first time in what must have been middle school, when the separate novels were published in an especially artistic style, intricate covers with green translucent parts and color splash pages included. I'm afraid that at the time, I did not appreciate the manga at all. I read it once and then never picked up again until now. I was surprised this time around, that I understood a great deal more than I had originally, which may have something to do with accepting a motif that runs through Clover and many of CLAMP's other series: the pursuit of happiness. Yes, happiness can be visiting that amusement park that you said you would, singing for the ones you love, or finally working up the courage to step into the outside world. Even if the consequences are terrible, the one moment of happiness made it worthwhile. My only problem with the series is that it is, and will probably remain, in its infant stages and unfinished. Even so, it is a wonderful read, and I encourage anyone to pick it up. Before I began reading this series all I knew about it was that the art was gorgeous and many people seem to find the story confusing. I never found the storyline confusing, and felt a lot of sympathy for the main characters, especially Sue. The setting was intriguing and provided the perfect backdrop for this whimsical tale. The experimental style of the panels was very refreshing. I was absolutely blown away and inspired by CLAMP’s art work here and imagine that I’ll be re-reading this many times in the future as I seek inspiration in my art studio. Fascinating story with exquisite art by Mokona. The art style and science-fiction element remind me somewhat of Chobits. However, the art is much darker and definitely has a steampunk-retro-science-fiction style, and the same is true of the story itself which is more along the lines of X. Both are engrossing, and have that CLAMP style of implying and hinting at backstory that is never told, or only doled out in the smallest bits along the way. I wish this short manga series had been more popular Fascinating story with exquisite art by Mokona. The art style and science-fiction element remind me somewhat of Chobits. However, the art is much darker and definitely has a steampunk-retro-science-fiction style, and the same is true of the story itself which is more along the lines of X. Both are engrossing, and have that CLAMP style of implying and hinting at backstory that is never told, or only doled out in the smallest bits along the way. I wish this short manga series had been more popular as it's one of the most intelligent of CLAMP's works that I"ve read (and actually has an ending). I normally don't include manga in my list of books read, but this is the omnibus edition, and the series needs reviewing. The art is gorgeous, detailed, and yet minimal. Clover is one of Clamp's earliest works, and in terms of art, it's arguably, the best. The story is short, focusing on four "clovers", especially strong psychics, and how they meet and how their lives are intertwined. The use of symbolism is consistent and beautifully employed. This edition includes gorgeous color images from Cl I normally don't include manga in my list of books read, but this is the omnibus edition, and the series needs reviewing. The art is gorgeous, detailed, and yet minimal. Clover is one of Clamp's earliest works, and in terms of art, it's arguably, the best. The story is short, focusing on four "clovers", especially strong psychics, and how they meet and how their lives are intertwined. The use of symbolism is consistent and beautifully employed. The artwork is heartbreaking beautiful, but it left me wanting. I understand that more volumes were intended but never completed, and the ending, or lack of, shows that. Still, I'm glad I read this, though I think the four volumes could have very easily been one. I found myself flipping past pages, because they were repeat after repeat of the same lines. For dramatic effect, to bring out the emotions they wanted to evoke, but it was a bit too much for me. But gorgeous art, and although this was The artwork is heartbreaking beautiful, but it left me wanting. I understand that more volumes were intended but never completed, and the ending, or lack of, shows that. Still, I'm glad I read this, though I think the four volumes could have very easily been one. I found myself flipping past pages, because they were repeat after repeat of the same lines. For dramatic effect, to bring out the emotions they wanted to evoke, but it was a bit too much for me. But gorgeous art, and although this was my first CLAMP, it won't be my last. That's the best manga CLAMP have ever made! Ugh, CLAMP, why do you do this to me every. single. time? Your art is so so so gorgeous, but your storylines are so disjointed and weird... not as weird as the ending of Tsubasa or X/1999, but still weird. This struck as me very similar to X/1999, especially the story-line and main male character. Seriously, the best part was definitely the art. The characters are just so gorgeous and the layouts in this series in particular were gorgeous: stunning backdrops, the song lyrics, and Ora, just wow. Or Ugh, CLAMP, why do you do this to me every. single. time? Your art is so so so gorgeous, but your storylines are so disjointed and weird... not as weird as the ending of Tsubasa or X/1999, but still weird. This struck as me very similar to X/1999, especially the story-line and main male character. I’ve never read manga before so this was something new. I would say i didn’t enjoy the style and I probably won’t read more. This is a big part of the poor rating. The best part was the artwork: uniquely done and laid out in a way that seemed fresh throughout the 500 page book. I found some of the pictures a little small and hard to see and it took a while to be able to tell some of the characters apart. I found the story to be repetitive and a little flat. The first couple stories followed each I’ve never read manga before so this was something new. I would say i didn’t enjoy the style and I probably won’t read more. This is a big part of the poor rating. Clover is a surprising gem. It develops a complex world with multiple competing political factions and magical beings. While the main plot revolves around a developing romantic relationship between two characters, the flashbacks, side characters, and larger political conflict is the star of this manga. Clover also has gorgeous, cinematic art with steampunk character designs. My main complaint is that the story did not have the time to delve into the world as much as I would have liked. CLAMP shou Clover is a surprising gem. It develops a complex world with multiple competing political factions and magical beings. While the main plot revolves around a developing romantic relationship between two characters, the flashbacks, side characters, and larger political conflict is the star of this manga. Clover also has gorgeous, cinematic art with steampunk character designs. Beautifully drawn, heartachingly written... An old classic of CLAMP's genius. The minimalistic and incredibly symbolic style of manga is groundbreaking, genre-bending (to quote the preface to the book itself) and makes the reader feel something so unlike much of the shojo manga out there in existence...a sense of wonder at what manga can be. I wish CLAMP would finish what they start. This is a beautiful manga, but it's clearly not finished. The story is lovely, but much shorter than it should be. I can't help giving it a higher rating than it should have. The art work is just that gorgeous. This book was a whirlwind ride. Though I enjoyed it, I was confused at times, and chunks of exposition seemed to be missing from the narrative. Couldn’t really get into the story, but the art, paneling, page layouts are incredible. Really beautifully created world—wish the narrative plot was strong enough to carry the graphic plot. This was not what I expected. A story about a young girl who needs to make a journey. Then the story goes back in time and tells the back story that is hinted at in the first part. Art is amazing (another reason to love Mokona), and story was moving. This graphic novel was a very new and interesting experience for me. This book tells the story of a girl, named sue, who, alone, had one wish: the desire to see a place called Fairy Park, and how her wish was granted. This kind of book would be enjoyed by a person who enjoys visual effects and pictures. In Clover, there aren’t as many words as normal in a comic or graphic novel, but the pictures make up the details even more so than just words. This is because the panels are not always constrict This graphic novel was a very new and interesting experience for me. This book tells the story of a girl, named sue, who, alone, had one wish: the desire to see a place called Fairy Park, and how her wish was granted. This kind of book would be enjoyed by a person who enjoys visual effects and pictures. In Clover, there aren’t as many words as normal in a comic or graphic novel, but the pictures make up the details even more so than just words. This is because the panels are not always constricted, allowing for a more expansive canvas, because gutters are sometimes used to split images apart, and because of the way the author and illustrator show the changes between actions and different perspectives. In the book the artist does not always constrict the images to an area. On page 63, the artist depicts the girl looking out the window, with two other empty windows next to her. This image illustrates how alone she feels. It is because there is no frame on this segment, it is understood that even though her space is limitless, as shown by the absence of a frame, she still is alone. It could also be seen as though she is looking down on people far below here, and, even though she would be much more important, as the more important people are generally higher up, she only desires to be with others, in order to keep her loneliness at bay. By not including a frame, emphasis was placed on all of the objects visible. This allows the reader to notice that not only is she far away from others, but there is also no one else like her, demonstrated by the way the windows are unoccupied while hers is filled up with her face clearly showing longing for companionship within its depths. In the book, the artist uses gutters to provide greater emphasis on certain things by using gutters like frames to split objects apart to provide greater contrast. On page 184, by using the panels with the speech bubbles in them as gutters, the picture of Ora is given greater importance through its depiction, and through contrast. The speech panels cover up parts of her face and hair, leaving what is important to Sue behind: Ora’s face. Also, the way the pictures is grainy shows Sue’s sadness about Ora’s death, but because the image of Ora is a happy one, the reader can understand that Sue still focuses on the love and happiness Ora brought into her life. The frames running across the entire page also show how Sue’s love for Ora cracked upon her death, but she still managed to persevere. In the book, the artist does a great job or showing movement across different panels. On page 139, when depicting the morphing hand, the artist shows it as unnatural because it is alone and takes up around half of the page in itself. The hand itself changes greatly, and the background subtlety but noticeably gets darker. This can be shown as an evil aura surrounding that hand, which matches up with the unnatural feeling associated with the hand. Movement is also depicted on page 167. Here, it is only shown by the appearing and disappearing of the teleportation cage around them. It is very dramatic as there is very little black on that half of the page not including the craft that they are flying on. This creates emphasis on what is happening in the background to their craft, instead of the actual actions. It uses a more passive action focus rather than an active action focus. Ah, CLAMP. Your artwork is absolutely GORGEOUS, especially in this book. It has PAGES of CLAMP’s gorgeous, detailed artwork in COLOUR, and I freely admit to being way too distracted by that. If you like CLAMPs art and the combination of simple layout and detailed accessories/art, this might be relevant to your interests. The character designs are lovely by the way - Sue, Ora and Gingetsu have my favourite designs of anyone in the manga, and the weaponry designs are fantastic. The story is told backwards, which makes more sense than it seems it should - the first two volumes deal with Sue and her journey, the third with Ora before that, and the last with Ran even before that. My favourite story arc has to be Ora’s, I’ll admit - she is my favourite character, just because she’s got a dream, and she’s got things that she loves and make her happy and regardless of what’s going to happen and when, she is going to live her life and her dream and enjoy it. She is my favourite. I would have loved to see more about the mystery plot that’s touched upon involving her as well - the plot of the main storyline doesn’t interest as much as that would. SPOILER, highlight to read: Although it IRKS ME TO ALL HELL that she is fridged. Although actually, I’m not sure whether it’s actually fridging at this point? She doesn’t seem to provide that much motivation for her boyfriend as it does for Sue - it seems more to be a motivation for Ora herself? It just annoys me that she’s killed and then it’s never explained, we don’t get to see it being investigated, NOTHING. Annoying. Also, as an aside, CLAMP! I see you are keeping up your trend of having the relationships be a touch on the creepy side - Sue is a tiny girl who appears to be about twelve or thirteen (there is no proof that she is or isn’t, because apparently the place she and Ran lived halted their aging and accelerate it should they leave, which really DOESN’T HELP ANYTHING because Ran looks about six in his origin story and is said to only have around five years to live, and Ran doesn’t look that much older, and - well, there is love and suggestions that some of these relationships are intimate and my brain is still flagging this as creepy. ... On the other hand, still not as creepy as the guy who seems to want to kill Kazuhiko and keep his corpse for um. Personal use. Um. BASICALLY, this is CLAMP being CLAMP in its usual “pretty but not necessarily wholesome mode,” and just. Yes. If you have read and enjoyed CLAMP you will probably enjoy this! I was drawn toward this massive volume of manga, partly because of its cover, partly because of the acclaim of the writers (CLAMP is a highly-tutted group responsible for such series as X, Chobits, xxxHolic, and more), and because this is a series that went out of print for the longest time, and was finally assembled in full by Dark Horse Manga. This volume is also notable for presenting the complete series in its proper back-cover-to-front-cover, right-to-left format as was originally intended. I was drawn toward this massive volume of manga, partly because of its cover, partly because of the acclaim of the writers (CLAMP is a highly-tutted group responsible for such series as X, Chobits, xxxHolic, and more), and because this is a series that went out of print for the longest time, and was finally assembled in full by Dark Horse Manga. This volume is also notable for presenting the complete series in its proper back-cover-to-front-cover, right-to-left format as was originally intended. It also contains a number of pages with bonus full-color artwork on glossy paper, making the volume even more worth the money. The manga itself is a pretty decent and fun read. It's not too dense or complicated at all; it took me just a couple of hours to read all five hundred pages. Most of the action will be in the first volume, which represents the main bulk of the story's conflicts. It portrays an interesting universe that's highly futuristic, but also very retro, like a cross between cyberpunk and steampunk. There are quite a few pursuits and fights in the first volume, building up a a simple yet thrilling storyline. I found it a little tricky trying to understand the characters and what was going on, but then the remaining volumes of the manga goes backwards to reveal the full background of the events. The action dies down substantially as the drama increases in the later volumes; it makes for a rather anticlimactic story arc. However, it does prove to be a rather strong story, thanks to the flashbacks provided. The later volumes provide so much to the characters, story, and concepts that it makes the first action-packed volume all the more compelling. Above all, I realized that the characters are compelling, and I grew to care for them by the end of the book. It helps make the more tragic scenes stand out stronger, so the manga does have a fair amount of emotional punch. It also helps that the story boasts a number of interesting concepts and ideas, and plays off of them to support the overall story. My only real complaint is that the story could have been arranged differently. I felt it would have been more prudent to provide the flashbacks either before the main story, or intermixed with it. As it is, with all the background shoved at the end, it left me feeling a little lost during the main conflict, and it felt like it trailed off at the end. The manga has decent writing. It gets a little melodramatic, especially with its constant repeating of the clover song sung by the main characters, and the constant repeating of phrases like "I want happiness." Still, the book does strike an appropriately poetic and dramatic tone, which I suspect could be adapted into a really awesome anime or film. Artwork is phenomenal, featuring plenty of fantastic-looking scenes and settings. Characters are well-drawn and quite distinctive. Overall, I was quite happy with this compilation. Recommended. Out of the handful of Clamp series I've read so far, Clover is by far my favorite. In fact, I must look into getting my own copy of the compilation book, as I've nearly ruined the one I checked out from the library. You're probably wondering why I've nearly destroyed the book (actually, it isn't that bad, but it's certainly not in the brand-spanking condition I checked it out in). I can't help reading it, for three main reasons. First, it's one of those stories that needs to be read several times Out of the handful of Clamp series I've read so far, Clover is by far my favorite. In fact, I must look into getting my own copy of the compilation book, as I've nearly ruined the one I checked out from the library. You're probably wondering why I've nearly destroyed the book (actually, it isn't that bad, but it's certainly not in the brand-spanking condition I checked it out in). I can't help reading it, for three main reasons. First, it's one of those stories that needs to be read several times to ensure you've captured all the details. Read it once, and you have a decent idea of what happened. However, the Clamp ladies came up with the ingenious idea to tell the story backward. Not completely backward; more like the Seinfeld episode with the wedding in India backward - in an episodic fashion. In a way this makes Clover even more tragic, blatantly foreshadowing death and destruction. There are three "episodes" that make up Clover, told from the most recent then going back in time. Each involves the same set of characters, revealing how they die, part from each other, fall in love, the promises they make and meet one another. Because we read it in that order, nuances that made no sense in the first chapter make perfect sense by the last. Finally, each "episode" has a poignant poem, lyrics if you will, that flow throughout each chapter. My own brain has already been setting music to the first poem (I just need to find time to write it down). I imagine a soprano part with plenty of colloratura...well, never mind the technical detail, but every time I pick the book up, it's as though music floats into my mind. What I didn't care for too much were certain unexplained minor characters and unexplained situations. It seemed like perhaps there should have been a fourth "episode" that involved some kind of background between one of the protagonists and one of the antagonists (ie, Kazuhiko and Bols). It would have been great to know the history between those two. Far in the future, children with special abilities have been collected and contained under a set of military directives known as the Clover Leaf Project. "Clovers" possess unusual, unexplained powers over various technologies, allowing them to teleport people and objects, to summon weapons from thin air, and more. In this world, Sue is the sole four-leaf Clover, and she has grown up isolated in a gorgeous, clockwork cage. She is barred from all human contact as her attachments to and feelings for others could become weaponized, thereby jeopardizing the nation's security. Instead, she spends her days conversing with the disembodied voice of her "Grandmother" (one of the Elders) and the tragic one-leaf Clover, Ora, who lives out in the world as a singer. Clover demands great respect for its minimal, breathtaking art. Mokona uses white space to her advantage, and often uses that emptiness to reinforce the acute loneliness of Sue and her fellow Clovers. Sadly, I did find the writing repetitive in numerous places—Sue and Orha compose a song together that captures their shared isolation and their wish for escape and eternal happiness. I loved the lyrics the first few times around, but there came a point where the song became the entire plot line/dialogue and I found myself skimming over large sections of the text. I read the other reviews on Goodreads before setting out writing this (as I always do for good or ill) and it seems that we only got 2/3 of what Clover was originally meant to be. Maybe that's why it's nonsensical. The "written word" part of it is just that: incoherent. The lyrics from that song, in 110% cliché anime style (i.e generic song that has the words love, happiness, forever, together, alone, tears and heart mixed, sautéed in soy sauce and served on the spot) repeated ad nauseam was qui I read the other reviews on Goodreads before setting out writing this (as I always do for good or ill) and it seems that we only got 2/3 of what Clover was originally meant to be. Maybe that's why it's nonsensical. The "written word" part of it is just that: incoherent. The lyrics from that song, in 110% cliché anime style (i.e generic song that has the words love, happiness, forever, together, alone, tears and heart mixed, sautéed in soy sauce and served on the spot) repeated ad nauseam was quite annoying and the plot in general didn't exist at all. Yes, I've concluded that it can't be my fault that almost all anime/manga plots fly right over my head. This one in particular... wow. It was so irrelevant or so it seemed, that I think it would have been better if I had "read" it in Japanese (or whatever other verb you can use to describe at least trying to read something that's in a foreign language and you by deafault only pay attention to the shapes of the letters/characters/kana). Anyway, I can imagine the aesthetics take a hit when the kana and kanji have to be replaced with latin characters. Unlike the plot which doesn't really matter, it's the drawing that shines here. The steampunk/clockwork angel & sparrow thing works well and is pretty to look at on the experimentally laid out pages that flow in lightning speeds. Even like that, I ended up liking it and it's probably because some parts reminded me very strongly of my girlfriend who's the one who came to my house one day and out of the blue just left Clover on my desk. While I enjoyed the visual feast, I must confess that this style in the end is just not for me. If it wasn't for her, I would have probably never touched it. But, sentimental a critic as I am, my feelings governed these keystrokes.